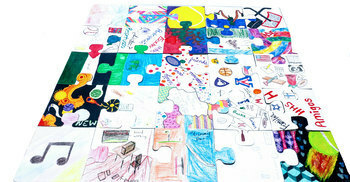 Allow your students creativity to flourish as they design their puzzle pieces. This engaging activity will have your students talking and sharing about their interests, talents and abilities. Together, students are encouraged to create classroom community by learning about each other. As educators, we are inspiring our students to take ownership of their learning as well as encouraging them to engage in their learning. This activity is designed to give students an opportunity to think about their role in their class and to see that they are responsible for their learning. This activity also allows students to use their creative skills in order to think about themselves and what skills, interests, talents and abilities they bring to class each day.